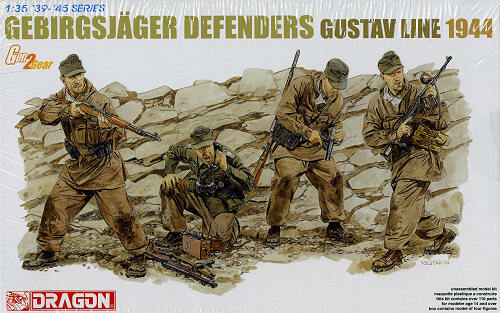 This particular set of figures from Dragon, portrays a group of defending soldiers on the Gustav Line in Italy during 1944. You'll notice that these are probably mountain troops as they are all wearing solft hats instead of steel helmets. The four figures are in various poses including loading a weapon and talking on a field telephone. As is common with newer Dragon figure kits, this one comes with a variety of slide molded Gen2 gear that includes weapons, packs, binoculars and other bits and pieces. This makes for an excellent set that will look great in your next diorama. Thanks to www.dragonmodelsusa.com for the preview set. Get yours today at your local shop or on-line retailer.